Eight Days A Week: The Touring Years. THE BEATLES Eight Days A Week: The Touring Years Rare official 2016 UK Bafta For Your Consideration advance PAL DVD screener featuring the Ron Howard directed documentary film about The Beatles career during their touring years from 1962 to 1966 from their performances at the Cavern Club in Liverpool to their final concert in San Francisco in 1966. This was issued to voting members of the academy in consideration for the Best documentary category which unfortunately it didnt win but did win an award for Best Music Film at the 59th Grammy Awards. This is an actual DVD and not a DVD-R comes hosed within a custom didgipak style DVD case with the released artwork on the front review highlights on the back and details as to what catigories the film was enter in for although only made it to just the one. The sleeve displays some light general wear whilst the disc remains clean and free from any marks on the plasyig the surface. A hard to find item and the first we have ever seen BAFTA49 Items are excellent to mint condition unless otherwise stated and we use the Record Collector Grading System to grade all our items. [710269 - E02P - FP]. Items are tracked and tracking detail are provided. This item is in mint or excellent condition unless stated above. Les Beatles Los Beatles Die Beatles Fab Four. Presstoplaylimited [part of Esprit International Limited / EIL] are the world's largest retailer for rare, used and hard to find vinyl, CD's and music collectibles from the 60s, 70s, 80, 90s through to today. 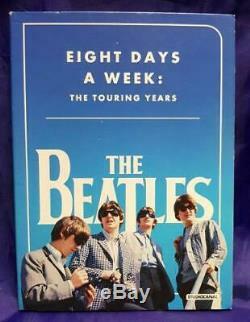 The item "Beatles Eight Days A Week The Touring Years UK DVD promo BAFTA49 APPLE CORPS" is in sale since Saturday, February 9, 2019. This item is in the category "Music\Other Formats". The seller is "presstoplaylimited" and is located in Kent. This item can be shipped worldwide.